As Europe faces what is possibly its greatest refugee crisis since World War II, the issue remains a faraway problem for Japan. But with the paltry number of refugees admitted into the country each year — a mere 11 in 2014 — some say there is plenty of room for Japan to play a much more expansive and important role. Could the journey thousands of kilometers away to Japan be a realistic option for Syrians fleeing their war-torn nation? On Thursday, the flood of refugees — many from conflict-hit Middle Eastern countries — continued to stream into Europe. In desperate bids to escape, many are gambling their lives on making the perilous journey across the Mediterranean. The United Nations estimated earlier this week that at least 850,000 people were expected to cross the Mediterranean seeking refuge on the continent this year and next, though it admitted that even that figure was conservative. Such astronomical figures have prompted some in Japan to take a long, hard look at its strict refugee policy and how to fix a multitude of pervasive structural problems that have stifled its humanitarian efforts. While known for providing huge sums in aid on the international stage, Japan has largely been absent from the realm of hosting refugees. According to the United Nations High Commissioner for Refugees, Japan was the No. 2 contributor to the U.N. refugee agency in 2014, donating more than $181 million. 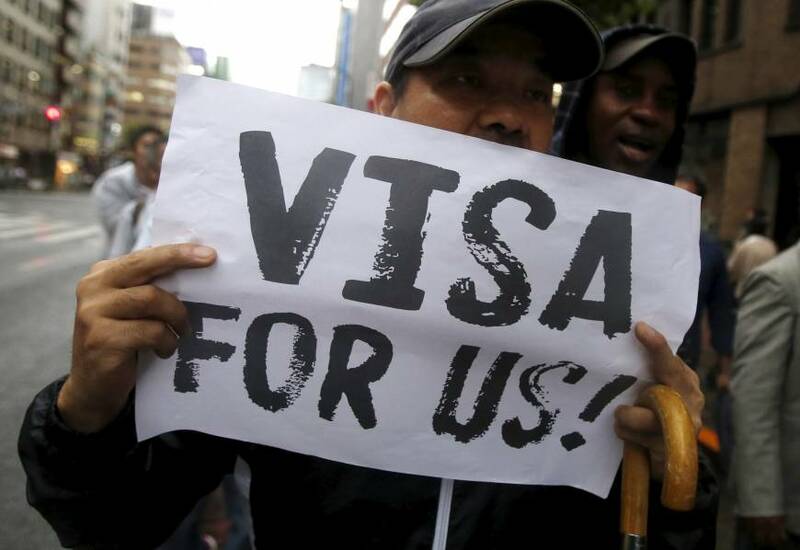 But in the same year, Japan’s Immigration Bureau approved just 11 of the 5,000 applications — a mere 0.2 percent — filed by those seeking refugee status. While Tokyo granted refugee status to three Syrians in 2014, according to the nonprofit Japan Association for Refugees, it has only issued special visas to Syrians since then based on what the government calls “humanitarian considerations.” Under these visas, however, it remains difficult for refugees to bring over their families and create a more stable life in Japan. Compared with those who are granted refugee status, those who receive special visas are ineligible for government assistance, such as Japanese classes and vocational training. “Given the dire global refugee situation, with an ever increasing number of new refugee emergencies, including the ongoing Syria crisis, itis hoped that the Government of Japan will favorably consider the admission of Syrian refugees on humanitarian grounds, in order to preserve the protection space for Syrian refugees in the neighboring countries, as an important sign of international burden and responsibility sharing,” the UNHCR’s Japan office wrote in a July position paper. These policies have prompted a raft of criticism from both within and outside the country. Shiho Tanaka, coordinator for the public relations unit at the Japan Association for Refugees, claimed that Tokyo’s approach to refugee issues does not address the assistance needs of the current crisis and lags behind that of other countries confronting the influx of displaced persons. “Many countries in Europe, which have seen a sharp increase in asylum seekers in recent years, have been broadening their refugee definitions and support for asylum seekers, taking into account their actual needs,” Tanaka said. “They have been addressing the situation by accepting more refugees, still in accordance with the Convention (Relating to the Status of Refugees) and UNHCR guidelines. “In comparison, Japan has only been processing the applications by strictly abiding by the convention and related guidelines without referring to how other countries have been addressing the changing situation,” Tanaka added. 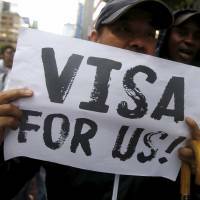 But a refugee inspector at the Immigration Bureau, part of the Justice Ministry, argued that there are many problems associated with processing refugee claims. The inspector said that while all refugee claims are screened in accordance with the convention guidelines, those fleeing war zones are not necessarily eligible for assistance. The convention specifies that those who demonstrate they were persecuted or fear persecution due to race, religion, nationality, political opinion, or membership in a particular social group should be deemed refugees. Critics have also assailed the administration of Prime Minister Shinzo Abe, who in March pledged $200 million in aid to help refugees fleeing the Islamic State group in Syria and Iraq. Two Japanese were beheaded later that month by the extremist group after being held for ransom. Detractors say that aside from throwing cash at the terrorism and refugee problems, Abe’s administration has done little to open Japan’s doors to those affected. Earlier this week, a Foreign Ministry spokesman said Japan was working with the international community to determine what it could contribute in response to the requests for assistance related to Syria. Meanwhile, Australia said Wednesday that it would accept 12,000 Syrian and Iraqi refugees in addition to its existing humanitarian intake of 13,750 refugees for the year. Mieko Ishikawa, director of Forum for Refugees Japan, said that the Japanese government’s efforts lack transparency, and that its failure to set out specific goals and solutions for any strategy in response to the Syrian refugee crisis have been disappointing. “In recent years many countries have responded, admitting thousands of people in accordance with the (UNHCR-backed) third-country resettlement program,” she said. A pilot resettlement program was introduced in Japan in fiscal 2010 to accept Myanmar refugees in Thailand, and was later expanded to include refugees staying in Malaysia. Also, Ishikawa said, Japan has a reputation for accepting mainly high-profile refugees who are obvious targets of persecution and considered at high risk. “But most Syrians fleeing the country are common people, not well-known,” she said. JAR’s Tanaka believes that one of the biggest problems with Japan’s refugee recognition system was written into its Immigration Control and Refugee Recognition Act. Tanaka said the convention clearly spells out who is a refugee and obliges all signatories to adhere to this definition. But since there are no guidelines on how the assessments should be carried out, each country has taken a different approach, which is reflected in their varied acceptance rates. And while Japanese immigration officials have been known to defend their low approval rates by citing the lack of infrastructure to support people with different religious beliefs and cultural backgrounds, Tanaka believes this should not be considered a decisive factor in the assessment process. Ishikawa of the Forum for Refugees Japan, points out that accepting Syrian refugees might even help Japan defuse its demographic time bomb, by allowing them to contribute to regional revitalization. As an example of a past success, she cited the intake of more than 11,000 Indochinese refugees from 1978 to 2005, which led to the development of a grass-roots community in Japan. In that sense, she said, there would be fewer obstacles to integrating the Syrian refugees with Japanese society, because they already have a support network. “The Muslim community in Japan, with growing businesses addressing their needs, such as accessibility to halal products or mosques, is more securely established than people think,” she said. Still, actually putting down roots in Japan would likely prove to be a formidable obstacle. “Acceptance of a large group of Syrian refugees might be challenging for both sides — for Japanese society and those granted refugee status — and would require the establishment of a community infrastructure,” JAR’s Tanaka said. But Tanaka said there could also be benefits.